Anybody looking for the right cornbread recipe to have alongside a steaming bowl of chili (perfect for the colder weather) should try out this Manuka honey cornbread recipe as soon as possible! When it comes to cornbread lovers, they tend to fall into two categories—those who want no added sugar and those who prefer their cornbread with a tinge of sweetness. For the latter group, this recipe treats you to a healthy dose of Manuka honey rather than a guilt-inducing dose of sugar. Not only does the honey fulfill one’s sweet tooth, but it also provides that rich flavor the New Zealand honey is famous for. Whether you’re eating the cornbread fresh out of the oven or having some leftovers two days later, you’ll be satisfied with your meal to no end. So, if you think that this is the right recipe for you, get your ingredients out and let us get started on that Manuka honey cornbread! Prep Time: 5 minutes. Cook Time: 25 minutes. Total Time: 30 minutes. Before you begin, make sure that you have an oven rack at about the middle of your oven. Preheat the oven on the Bake setting to 375 degrees Fahrenheit. Spray an 8×8-inch square pan (or round cake tin) with cooking spray. You could use butter instead if you prefer to add the extra flavor. In a medium-sized bowl, whisk the Manuka honey, the buttermilk, the butter, and the eggs together until the honey has fully incorporated with the mixture. In a larger bowl, whisk the flour, the cornmeal, the baking soda, the baking powder, and the salt together. Now, pour the wet ingredients into your dry ingredients and mix them together thoroughly. Pour the batter into your ready pan, and then bake between 25 and 30 minutes or until it is golden brown in color. Allow the cornbread to cool in the pan for about five minutes before serving. You should have about eight servings, each of which is about 290 calories. 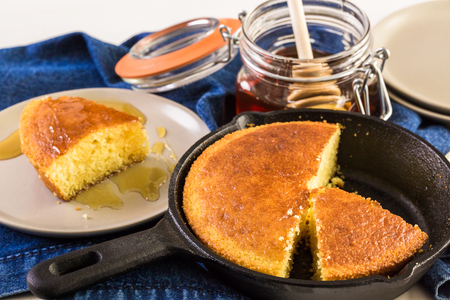 Enjoy your Manuka honey cornbread!